Do any of us truly have a place we can call home? 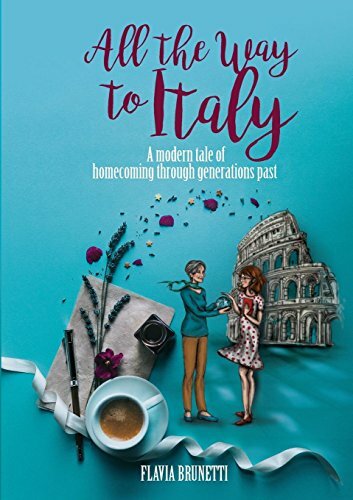 Flavia Brunetti tackles the concept of our origins and the roots that connect us in her book, “All the Way to Italy:A Tale of Homecoming Through Generations Past.” Brunetti’s thought-provoking travelogue winds us through one young woman’s journey of self-discovery and identification. Brunetti’s story paints a picture of Little who has so many unanswered questions. Following an unfortunate incident, Little is removed from her Italian birthplace and her parents. She is seemingly forever frozen in time by her nickname “Little,” an accurate description of the identity that remains after she is plucked from Italy and taken to America as a child. When Aunt Sira asks Little to return to Rome, she obliges despite the resistance the visit stirs. In particular, Little is plagued with the memories of a father who has recently passed and a mother who disappeared from her young life. Sensing that her past is still being covered up to protect her, Little realizes that these secrets are the keys to unlocking her sense of belonging. As Little begins to unravel her tangled roots, stories surface that keep her searching and yearning for more answers. The sights and flavors of Italy are vivid and entertaining in Brunetti’s book. Since having traveled the country, I welcomed visions of the famous landmarks, streets and foods. In my recollecting, I could imagine Little re-experiencing the country and falling in love with it. The settings feel authentic and, whether or not you’ve toured Italy, you will find yourself savoring the visit. Especially heartwarming is Little’s Aunt Sira. Her Italian temperament is insistent yet affectionate. She stands strong and reflects the culture that haunts Little and connects her to her homeland. Although we meet many characters in this story, they are merely backdrops on Little’s journey to finding herself. But this is perfectly acceptable, as each small relationship contributes to Little’s past and builds on her identity. Brunetti’s tale drifts off course at times. Meandering along with Little, the narrative ebbs and flows until Aunt Sira carries you up to the surface and fastens you back to the storyline. For the most part, these soliloquies are suitable, as it is in keeping with the way our minds work. And, on most occasions, the wandering lends a cultural authenticity to the author’s tale.